A key British naval port since the early 18th century, Antigua has long been a favored destination for sailors. When I first visited the island in 2012, I fell in love with the place. Strolling around historic Nelson’s Dockyard, I was captivated by the history and grandeur of the 18th-century sail lofts, officers’ quarters and capstan house used to careen and repair the Navy&apos;s old wooden ships. At that time, I was on a two-week cruise through the Leeward Islands on a 40ft Jeanneau I had chartered from Sunsail in St. Martin. I had just missed Sailing Week, but the aura of this massive yearly gathering of some of the world’s best sailors and yachts still hung in the air. I was running short on my charter, so I only spent two nights in Antigua. However, I vowed that I would one day return and see Sailing Week and the dockyard in full swing. When I heard that 2017 would mark the 50th edition of this awesome week of sailboat racing, I booked a ticket and packed my sailing gloves. 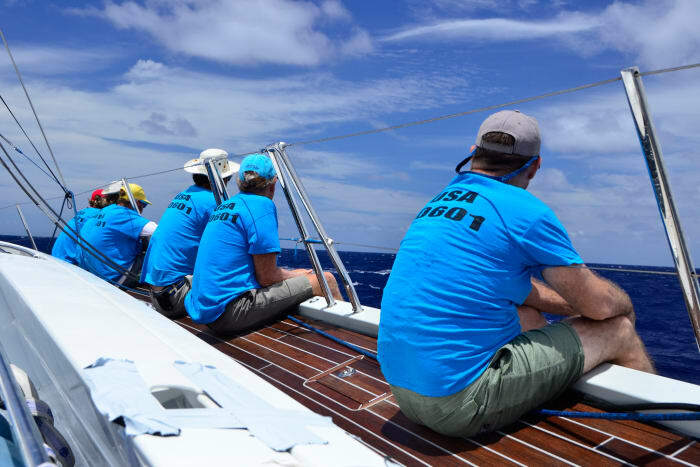 This year’s event, which ran from April 29 to May 5, brought sailors from all corners of the globe, racing on boats ranging from the massive 115ft Farr mega-yacht Sojana to a 24ft Melges. One of the more legendary entries was Kialoa III, a 78ft custom yacht built by Palmer Johnson that broke the Sydney to Hobart Yacht Race record in 1975 and retained the title for 21 years. I had the pleasure of racing against Kialoa III on Sapphire III, a 76ft CNB yacht from 2016 owned by John O’Connor, and while it would have been exciting to race on Kialoa III, the view was just fine from the luxurious decks of O’Connor’s CNB. I also hopped on Hot Ticket for a day’s racing. This speedy King 40 owned by Jim Hightower is crewed by some very friendly and talented good ol’ boys (and girls) from Texas. My job was trimming and grinding; thanks to the boat’s undersized winches and jib-sheet twing that added a lot of friction, this was a pretty physical race, to say the least. With 145 boats in 16 classes, there are many opportunities to hop on boats and race, and for those in search of a spot, there’s an official crew board you can sign up on, or you can just walk the docks and ask if anyone’s shorthanded. You can also grab your sailing buddies and rent a special race-rigged boat from charter companies like Sunsail and Dream Yacht Charter. I met a group of Germans who were racing in the bareboat charter class on a boat called Klassenfahrt, which means “school trip.” They were all celebrating their 50th birthdays on a 50ft Jeanneau on the 50th edition of Sailing Week—neat concept! Probably the biggest upset this year was watching the pint-sized Melges 32 Lazy Dog capture the event’s most coveted prize, the Lord Nelson Trophy—which just goes to show you, bigger is not always better. 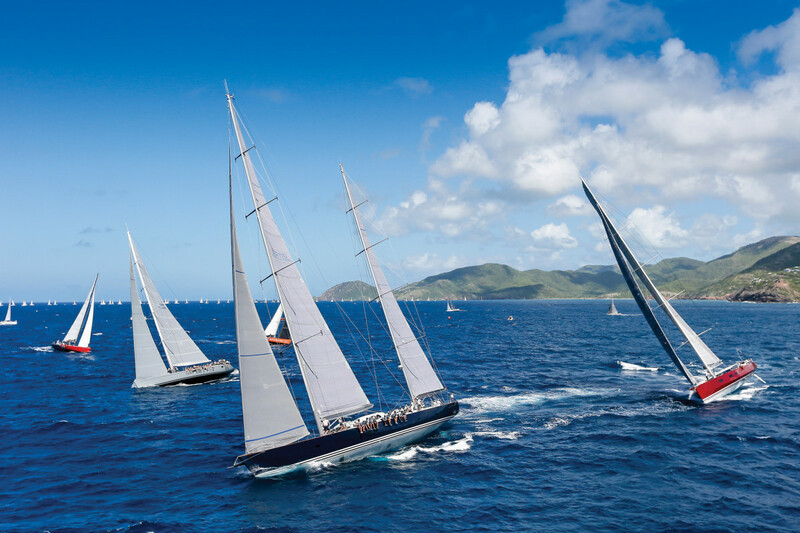 Whether you choose to race or not, Antigua Sailing Week is chock full of concerts, cocktail parties, “exhibition” events, rum tastings, beach parties and more. For spectators, there is also a prime vantage point to watch the races at Shirley Heights, a restored military lookout and gun battery that sits high on a mountain overlooking English Harbor on Antigua’s most southernly tip and hosts lively barbecue parties Sunday and Thursday evenings during the season. If you want to take a break from the racing and parties, there’s plenty to do on the rest of the island as well. In fact, Sailing Week is a perfect time to visit, since it’s the tail end of tourist season, but the weather is still great and the island’s many amazing resorts and beaches are relatively empty, especially if you stay a few days after the races end. Getting around is a bit hampered by the fact that hotels and vendors are generally not allowed to offer shuttle services, leaving public buses, car rentals and taxis as the only options. My recommendation is to lock in a local taxi driver who really knows the island. I was fortunate to find Cleo Henry, whose family has run a taxi and tour company on Antigua for generations. She is highly reliable, super friendly and knows the island like the back of her hand. 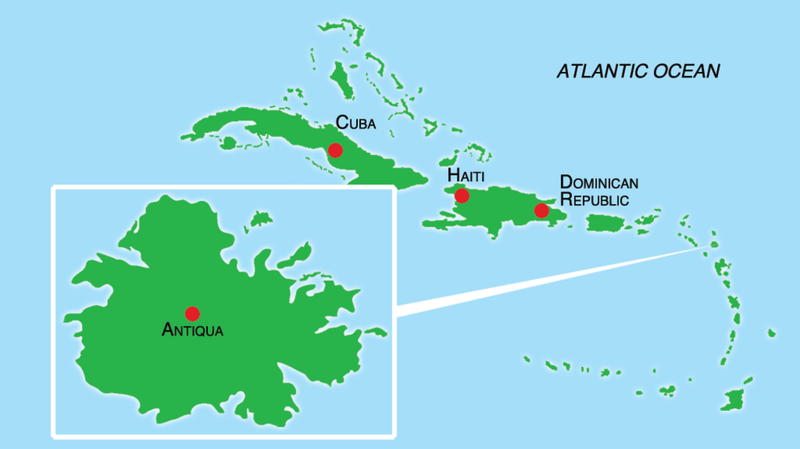 Many of the best beaches and resorts are on the Caribbean side. However, Nelson’s Dockyard, as well as most of the Sailing Week events, are on the Atlantic side, so you do have to choose your priorities wisely. I checked out a number of resorts, and each has its perks. 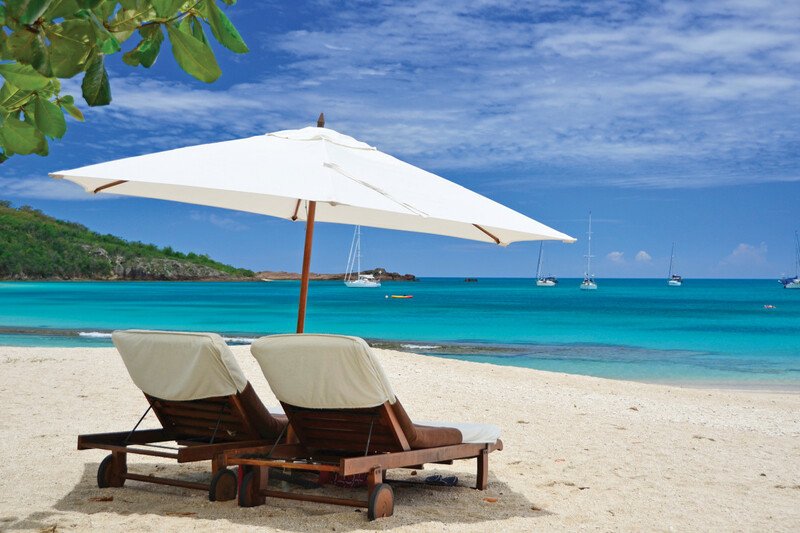 Antigua’s most famous and popular beaches. For those who want to be close to the events at Sailing Week, my favorite resort is The Inn at English Harbour. This classic inn is a collection of colonial-style, whitewashed, simple but elegant wooden structures strewn across a lush green lawn in front of a quiet, protected beach. They offer complimentary water taxi service to Nelson’s Dockyard, and the chef is one of the best on the island. If you’re looking for more of a classic beach hotel, with lots of water toys and more action, Carlise Bay is also relatively close to Nelson’s Dockyard. While on one of my kayaking adventures at Carlisle, I found an empty little stretch of sand just around the headland on the eastern end of the main beach that became my private little getaway. One of the spots on the Caribbean coast I especially liked is the Cocos Hotel, whose cozy bungalows are perched on a hillside overlooking Valley Church Bay and Jolly Beach, one of Antigua’s most famous and popular beaches. Also on the Caribbean side of the island is the rather upscale Hermitage Bay, which is set on a quieter and more picturesque, semi-exclusive bay. The elegant beachfront cottages and high-end service make it a favorite among honeymooners and romantics. If Sailing Week didn’t “sail you out,” Nonsuch Bay Resort also has a full-service sailing school and a huge fleet of all-inclusive sailing boats of various lengths and performance ratings. It even has a kite surfing school called 40 Knots. The instructors at the school told me sailors generally make good kite surfers, so I decided to give it a try. In spite of all the encouragement, I encountered a bit of a learning curve during my first lesson. That said, it was a blast, and I plan to take more lessons in the future. I always try to get in a couple of dives whenever I’m in the Caribbean, and Jolly Dive is one of the oldest operations on Antigua, with owner Paul Roos a treasure trove of info about diving in the area. As the name suggests, his shop is on Jolly Beach, just down from Cocos Hotel. As such, he takes guests mostly to sights on the Caribbean side of the island where you find more soft corals. Mamora Bay Divers, on the other hand, is located at St. James’s Club & Villas on the Atlantic side. Here you see more hard corals, as well as some interesting boulders and canyons to dive through. I also encountered more sharks on the Atlantic side. They were mostly harmless reef sharks. However, Mamora Bay Divers manager Linda Swann told me Antigua has a very healthy and diverse shark population. The place to stay on Barbuda is Barbuda Belle. Situated on a deserted, seemingly endless stretch of blazing white and pink sand beach on the northern most point of the island, this simple but elegant resort is paradise. Behind the resort is a mangrove protected area that is home to a huge colony of frigate birds. The biggest spectacle here is during mating season (September through April) when the male birds show off their scarlet red gular pouch on their necks. That being said, it was equally amazing to see these birds off-season, and my guides and I were the only people there. 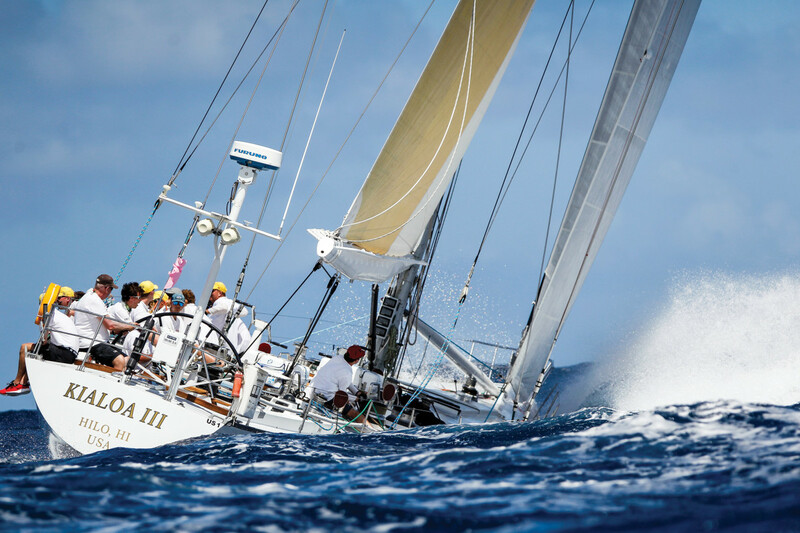 Sailing Week isn’t the only notable sailing event held annually in Antigua. There’s also the Super Yacht Challenge in February and the Classic Yacht Regatta, which runs mid-April. Now that I know what I’ve been missing, Antigua’s got a spot on my annual calendar. Next up, Super Yacht Challenge!